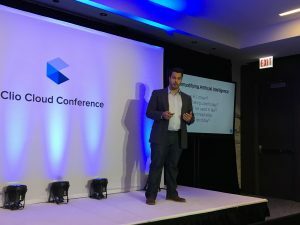 I’m sitting here at Chicago’s O’Hare Airport, on my way home from the fourth-annual Clio Cloud Conference, racking my brain for something critical to say about it. 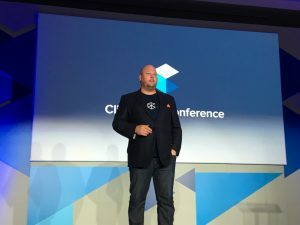 I’d been to all three of the prior Clio conferences, and, frankly, I’d gushed about them, calling the 2014 conference one of the best legal technology conferences I’d ever attended and describing last year’s as déjà vu all over again. So enough gushing. Surely I must have something critical to say. No conference is perfect. What were the nits I could pick here? And then it occurred to me. One huge fault with this conference. It’s too short. Two days simply were not enough to take in all the great programming, learn about each of the exhibitors and spend time getting to know more of the 700 people who attended – every one of whom, it seemed, had good stories to share about their law practices or businesses. CEO Jack Newton gave the opening day keynote. But a longer conference is not to be. Clio closed this conference with the announcement of next year’s dates. It will again be just two days, Sept. 25 and 26, 2017. 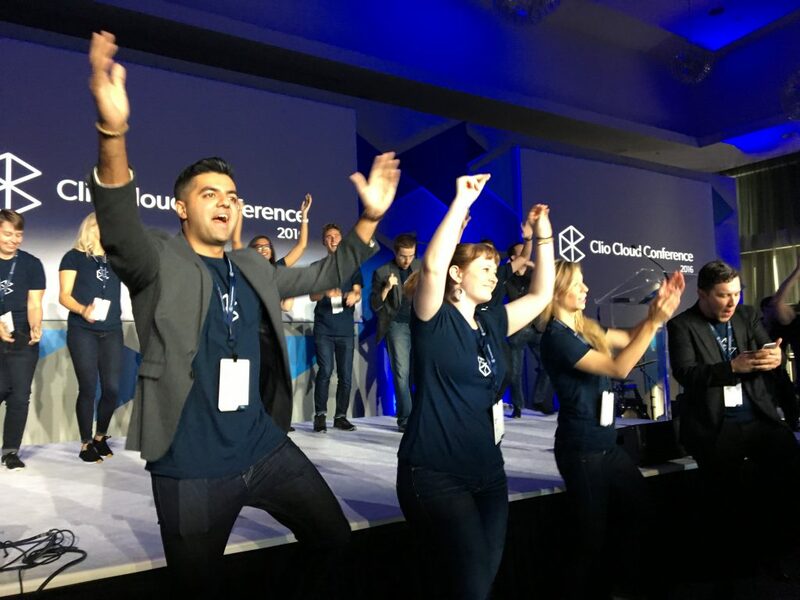 But for the first time, Clio is moving the conference out of Chicago, where it has outgrown its venue, and taking it instead to New Orleans, where it will be at the Hyatt Regency. And I before I go farther, let me alert you to a ticket deal. For this week only, you can buy a ticket at a substantial savings. While the full price will be $699, this week you can get a single ticket for $199, two tickets for $299 and four tickets for $499. The deal is available at clio.com/ccc2017. I’ll talk more about the conference, but there are a couple of notable news items to report. One was Clio’s announcement of its new app, which I wrote about earlier this week. It is a complete reengineering of the app and Clio did a great job with it. To learn more about it, read my earlier post. But the announcement that generated the greatest buzz was about a new initiative to enable Clio users to make more-informed decisions about their practices based on quantifiable data. Keynoter Vaynerchuk was enthusiastically received. Clio now has 150,000 active users in its system across 78 countries. In a year, some $60 billion in legal billing goes through Clio’s system. 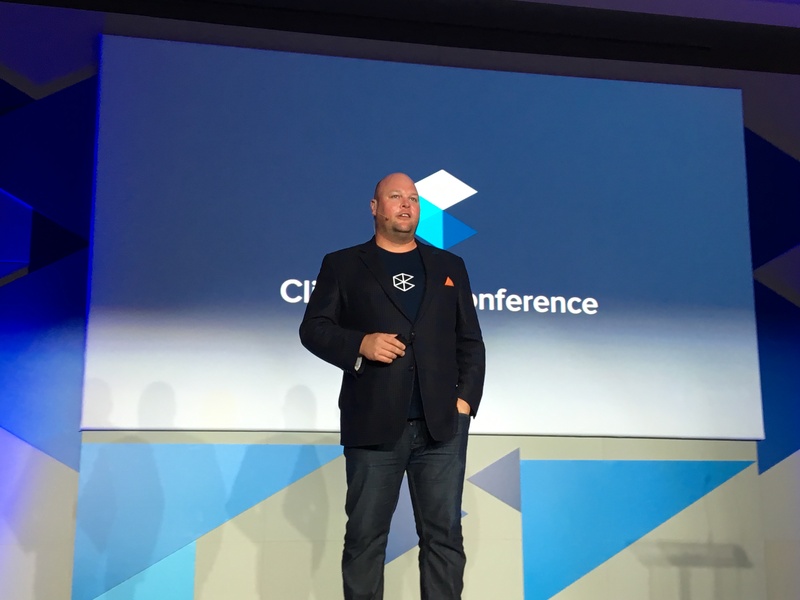 At his opening-day keynote, Clio co-founder and CEO Jack Newton announced that the company has now begun to anonymously aggregate this data in order to help its users make data-driven decisions about rates and fees and establish benchmarks for better understanding and evaluating their own practices. Clio will make this data available to its subscribers in various ways and will also publish an annual Legal Trends Report, the first of which will be released on Oct. 17 as an e-book. Newton said this report will be an annual State of the Union for the legal profession. Along with it will come the Billable Hour Index, showing national, state and local data on what lawyers charge and analyzing trends in legal billing. Newton gave a preview of these statistics, showing that lawyers charge more on average in the District of Columbia than anywhere else — $280 an hour. The index will also calibrate billable hours against the cost of living, to give a picture of the states in which lawyers are earning the most in real terms. But the finding that drew the most gasps from the audience was that lawyers on average bill only 2.24 hours in an eight-hour day and that solos on average are billing just 1.6 hours and collecting 1.4. Some lawyers I spoke to at the conference expressed concern about Clio’s data aggregation and what it might mean for the privacy of their client information and there was also some back-and-forth about it on Twitter. No client or personally identifiable information is disclosed in the aggregation, as Clio explains here. However, Clio provides its users with the ability to opt out of data collection. Note that both Thomson Reuters and LexisNexis similarly aggregate law firm billing data through their products Peer Monitor and LexisNexis Counsel Benchmarking, as I wrote about in this 2014 ABA Journal article. Both products aggregate and anonymize the data in the same way that Clio does. Clio’s benchmarking would be the first such service for solo and small firms. Another initiative Newton announced is Clio Apollo. “This is the first-ever ground-up redesign and rethinking of the Clio web app,” he said. Over the next year, Clio developers will work with the company’s customers and integration partners to make Clio’s interface as fast and intuitive as possible. “If you have to ask us how to do something in Clio, that’s a defect in our platform,” Newton said. This Apollo development project will take place over the course of the next year with the results to be unveiled at the 2017 Clio Cloud Conference. One of the hallmarks of the Clio Cloud Conference continues to be its programming. This year, it featured four tracks of programs – two general-interest tracks on business and technology and two Clio-focused tracks to help users learn the system and use it more effectively. Andrew Arruda from ROSS Intelligence. The speaker who garnered the most attention was keynoter Gary Vaynerchuk, an entrepreneur and social-media cheerleader. As Victor Li recounts at the ABA Journal, Vaynerchuk was rousingly received by a near-capacity crowd in the main conference ballroom. And Mike Whelan at Lawyer Forward thought Vaynerchuk was the most valuable part of the conference. I might have been the only person there who wasn’t wowed. 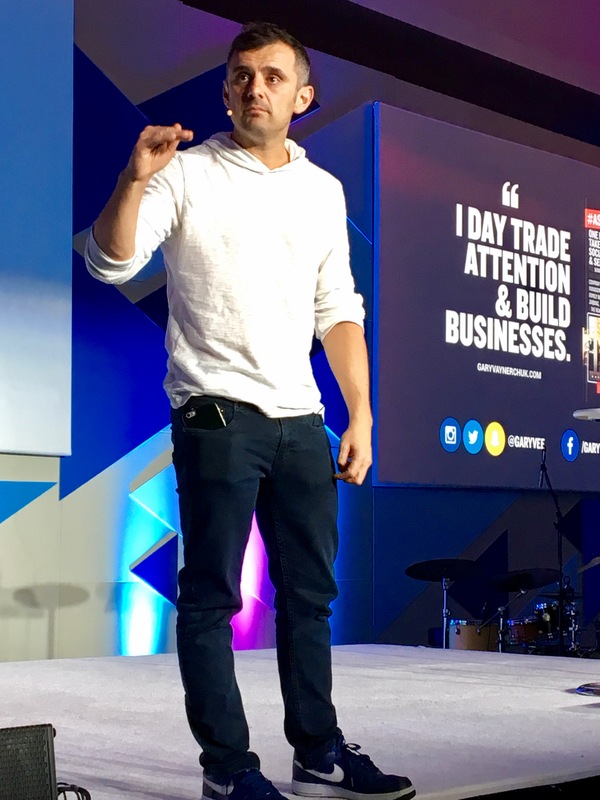 Vaynerchuk is a great speaker and a great presenter. But his 45-minute speech seemed to boil down to a pretty simple message – that technology is changing the world and that we must embrace this change by becoming producers of content and by engaging in online and social media. That’s a news flash that dates back to The Cluetrain Manifesto in 1999. Perhaps the most interesting aspect of his talk was that so many in the audience seemed not to have heard this message before. One of the most interesting programs I attended was “Artificial Intelligence and the Law: Science Fiction or Science Fact?”, presented by Andrew Arruda, CEO and co-founder of ROSS Intelligence, the company that describes its product as the world’s first artificially intelligent attorney. Whereas too much of the talk about AI in law is full of hype and misunderstanding, Arruda offered a practical and grounded explanation of what AI is and what it can do. And Arruda offered a peak of what is to come with ROSS. While it currently works only with bankruptcy law, ROSS will soon be rolling out a number of other practice areas and plans eventually to over all major practice areas. He also revealed that on the company’s long-term development wish list is to build an Alexa-like device for law, where you would verbally ask it a legal question and it would audibly give you the answer. I have said it of this conference in the past and I will say it again because it remains true: What most stands out about this conference is the people. Take away Clio staff and vendors from the 700 attendees, and you are left with about 600, I’d estimate, who are practicing lawyers. Most of these are from solo and small firms – although I spoke to one lawyer who was there from a firm of more than 500 lawyers – and most are from the U.S., although this year’s conference included registrants from India, Portugal, the UK, Spain, France, Switzerland, the Netherlands, and elsewhere. What stands out about these lawyers is their enthusiasm about improving their practices and in learning new technology, management and marketing skills to help them do that. These are folks who are here to share and absorb. There are no one-way conversations. Everyone, it seems, has valuable insights from their own practices to share and they are just as eager to hear yours. To me, this is the answer to McKeen’s existential challenge. The raison d’être of this conference is to bring together lawyers who are enthusiastic about building their practices and improving their lives and who have a thirst for ideas about how to do that through better management practices and better use of technology. The conference vibe remains Silicon Valley hip, from the dancing staffers to the abundance of black tee-shirts to the yoga breaks and massage chairs. But the takeaway is entirely practical. It is a conference that many of the attendees have come back to year after year, and that tells you a lot about what they get out of it. “This conference is all about building a vision of the future of law,” Jack Newton said in his opening keynote. I don’t know how far into the future Newton meant, but my sense was that lawyers who came here were very much focused on their short term futures, on what they can do today to get them where they want to be in a year or two or five. Yes, robot lawyers were on the agenda, but it’s the conference’s practical focus that keeps the human lawyers coming back.